There is something exciting about Ninjas. Whether it is the mystery behind what exactly they are or how on earth they can jump from building to building with relative ease, there is no denying the longstanding fascination with these ancient Japanese warriors. But apparently much of what we think of as "ninja" was invented in the 1960s and nothing but Hollywood clichés. In a new book that draws on historical scrolls, world renowned Ninja expert, Anthony Cummins addresses many of the longstanding misunderstandings. 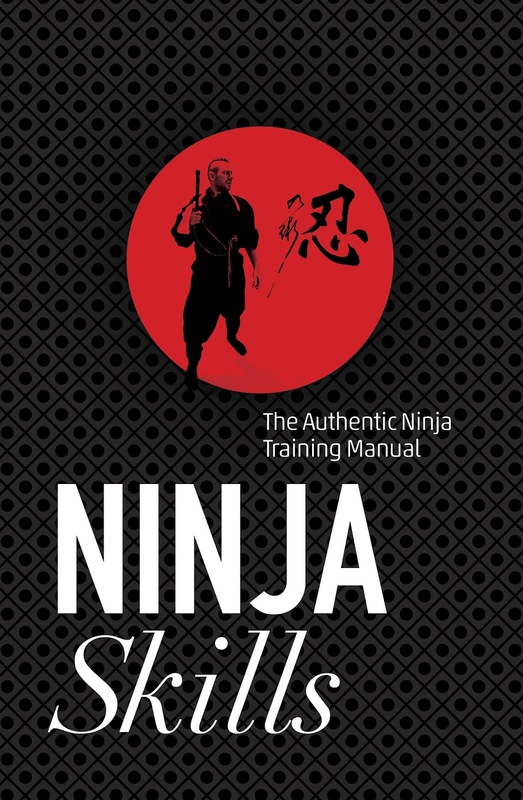 In Ninja Skills: The Authentic Ninja Training Manual, Cummins provides a unique illustrated guide to the real Ninja teaching for the modern man. With the book set to be unveiled, we spoke to Cummins about how he became a Ninja expert, the biggest misconceptions and what I need to do to become a Ninja. Where/when did your interest in ninjas start? There was no start date, I think it was at birth. Looking up at my grandfather in a toy shop in the early 1980s (I was born in ‘78) he asked, ‘do you want soldiers or ninjas?’ The fact that I knew what a ninja was at possibly 4 years old and thinking, of course ninjas, you know I love them, to me shows I had a memory of them before that time. However, I did go through ninja phases. First was the fantasy toy stage, then came the experimentation, games dressed as ninja in the woods and dark, a truly serious hide and seek. Next was the ninja training stage, but at last came the truth quest, when I realised all the other stages were based on myth and fantasy, so I searched out the truth across Japan- the truth was hard to find. What did you do before you became an expert in all things ninja? I would love to be an expert in ninja. That is my dream. An expert is that person you ask any question to and they can bore you to death with not only their answer but everyone else’s answer and why those people are wrong! While I know a lot about the ninja, my goal is to be that boring man who knows all arguments. What was the most surprising to me is that there were no Japanese experts and not only that, but the Japanese did not know very much about the historical ninja either. However, before the ninja I had multiple jobs. There were university degrees, and between them was life as an English teacher in Japan. When I was younger I was an undertaker (I have seen copious amounts of dead bodies), but my favourite job was being an on call assistant boson to the tall Ship Royalist where I would get an email and be asked things like “can you sail to Norway this weekend?” to which I would casually say yes and then dash for the door. Can you tell me something I probably didn't know about ninjas? Well the ninja were actually samurai, there is no such thing as ninja v samurai, that is totally made up. The ninja were the Special Forces branch of a samurai army and while some of them were lower level they were still soldiers of some form, or at least spies hired by the government of the time. It was never a ‘potato eating peasant’ with one tooth who lived in the hills. In addition, ninja had a deep connection with black magic, and it is not considered as black magic just from a Western point of view- even the Japanese of the time considered it dark. From beheading animals to make animal spirits, to pulling the eyes out of live dogs, to sending cursed dreams to the enemy, all of these were parts of the darker side of the ninja. Also, they were not called ninja, most researchers consider their original name was shinobi no mono (same ideograms but a different reading). What are the biggest misconceptions about ninjas? Number one is that people still think there are living grandmasters. Search the web and you will see “Japan’s last ninja master” and you will find at least three individuals who all claim that title. I wish it were true, but sadly it is not, all of their claims are very suspect and the things they teach (much of it incorrect) can be traced to early 19th century books. I have searched all of Japan, and the ninja simply died out. In truth the ninja is actually a job. As is a butcher a lawyer or a judge, the ninja was a role not a social position. Second is the idea of a ninja in hand-to-hand combat, which is not true either. It was the invention of one man in the 1960s and has now gone worldwide as an art form. Sadly people believe this and it is distorting actual history. Thirdly, ninja throwing stars- they actually have nothing to do with ninja! They are a real weapon but were used by swordsman to create a distraction, or by officers who captured criminals (something ninja also sometimes did). But, no they are not a secret ninja weapon. What do I need to do to become a ninja? A time machine. Ninja was a specific job in Japan and the best time to be a ninja was around 1500. Simply put you would have to live in Japan between 1300 and 1800 and have the patronage of a warlord, who would then pay you an annual wage so that you could creep around castles, drink in bars listening to conversations and have access to the gunpowder store so that you can blow things up. But above all that, you need ‘balls’. To be a ninja today would be the same as going solo on a secret mission across the Middle East or through war- torn countries. Imagine being told you needed to discover certain information 30 miles into the most dangerous parts of the land and told to bring it back, oh, and if you get chance, kill such and such. See you when you get back. You would need serious courage. If you could train anyone in the ways of the ninja, who would it be? James Bond. They are revisiting all the old bond clichés now and it is time for a new film in Japan and based on the ninja. I would love that email from Hollywood saying “so you know about ninja” and the answer would be “book me a flight I am on my way!” It is time to remake the ninja in a better way, the funds behind a Bond film could introduce the world to this new research on the ninja and Bond would be the best way to do that. You Only Live Twice was great but I would love to see the modern adaption. I would love them to realise that the ninja were very much a real section of history, ad they were real people who performed dangerous jobs. Most likely they were quite dark people living in a constant world of shadow but that they – at certain points – led some of the most interesting lives and that they had a real set of skills that you can actually read about and study today. The arts of the ninja are not secret. We have published multiple books, both ‘how tos’ and actual translations of ninja scrolls and I want people to know that if they wish to study the ways of the ninja, they can and it is fascinating. All I ask is that people help me keep these ancient ways alive. Antony Cummins is the author of Ninja Skills: The Authentic Ninja Training Manual (Watkins, March 2018, £15.99).